Composting is a great way to reduce, reuse, and recycle. You can compost a great many things. Whether it’s a health and safety issue or simply making sure the process works, there are some items that don’t belong in the compost pile. 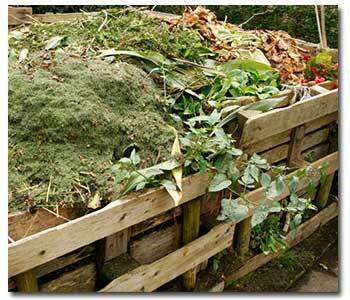 In this article, we’ll show you what to put in and what to leave out of your compost pile. The basic ingredients of a good compost pile are “Greens,” “Browns,” air, water, heat, and an activator (optional). The proper “recipe” is four parts browns to one part greens; air manages itself usually, but water may require assistance. Greens are high in nitrogen and activate the heating process. The best greens are weeds (before they go to seed), green leaves, fresh grass cuttings, fruit and veggies (and their scraps), coffee grounds and tea bags, and manure from chickens, rabbits, cows, and horses. Browns are high in carbon and provide “fiber” for your compost. The best browns are dead leaves, dead plants and weeds, cardboard, straw and hay, and small animal bedding. You can also compost paper towels, paper bags, torn up cotton clothing, egg shells, and hair (human, dog, cat, other animals) in moderation. If you put too much in, the process slows or stops. Air is a key ingredient to composting; at least if you want the type of pile that doesn’t stink or look slimy as composting without air produces. Turning your compost pile helps add more air. You want your compost pile to be damp like a wrung out sponge. This level of moisture may come naturally from the green items. You may have to add some water when you add new layers of material, especially if you live in a dry climate. Compost piles have to be hot, typically around 150 – 160 degrees Fahrenheit. This temperature supports the microbes that are part of the decomposition process. Monitor the temperature of your pile by touching the pile. If it feels warm or hot, all is well. But, if it’s about the same temperature as the air outside, the process is slowing or stopped. At that point, you need to add more greens to jump start the process. Adding extra nitrogen (activator) is an optional ingredient and will depend on the lack of green ingredients in your pile. A small amount of nitrogen fertilizer between each layer adds some additional nutrients. The rate to appy will be based on the type of fertilizer you are using. Different fertilizers contain different amounts of nitrogen, therefore the rate to add to your pile will be based on this at the recommended rate of .15 pounds of actual nitrogen for every 4 cubic feet of dry leaves. Blood meal, or fish meal would be good organic options. Please read the package label and speak with a garden pro for more information. If you have sufficient amounts of “green” ingredients adding more nitrogen isn’t necessary as this will supply enough nitrogen for microbes to thrive. If you are only adding “high-carbon” ingredients (like dry leaves) than adding a compost activator would be helpful in supplying enough nitrogen for microbes to thrive. You need to turn your pile once or twice a week. Breaking up clumps and working material from the outside to the inside of the pile keeps the process going strong. A good time to turn is when you add new materials. Slow-rotting things like wood shaving, wood ash, twigs, and hedge clippings can be composted, but they take a long time and will slow down the rest of the pile. If you compost these items, do it in a separate pile. Don’t compost nuts, pasta, bread, and cooked food. These items don’t decompose easily and slow down the process. They also become slimy and can tempt pests to visit your pile.